From time to time we have related how inexpensive life can be in Southeast Asia. Rents are wonderfully cheap for gorgeous places, medical care is excellent and costs a fraction of what it would be in the west. Dining out at local places is just a few dollars. Here in Penang that is all true but there is always a little something that doesn’t quite sit right. For example, as beautiful as this place can be with our gorgeous views over the water, it is unfortunate that, in this place, pretty isn’t always clean. You can’t swim off our lovely beach. Due partly to the shipping in the straits, partly due to shifting tides from land reclamation but more attributed to the lousy job Malaysia has done in managing what’s going into the water. In discussing this with Canadian friends Carol and Hank, they told us about their very special place, a spot they had been going to for years where the water is crystal clear and a long, 3 day weekend, all in, is as cheap as one room night in a lux resort. 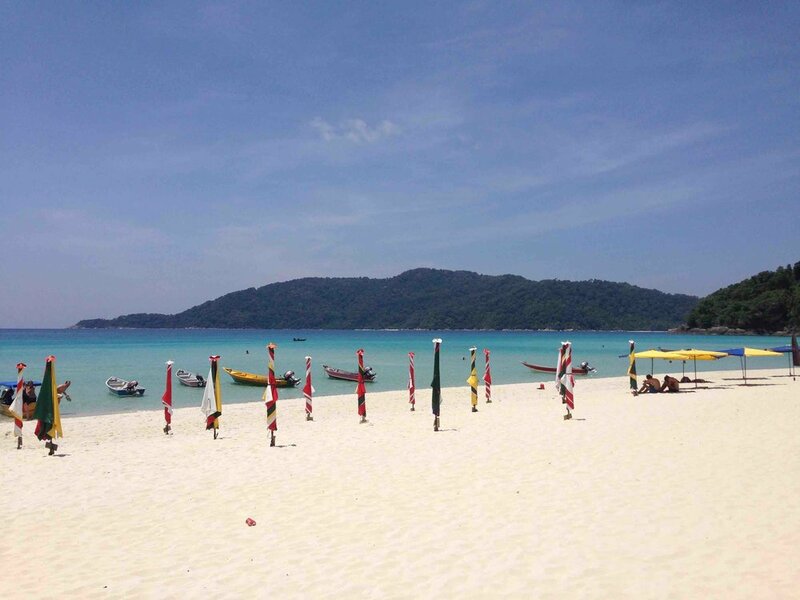 We were intrigued and in May, we joined them and another couple for a three day experience in the Perhentian Islands. This small island group is off the east coast of Malaysia in the gulf of Thailand. A good local airline, Firefly, deposits you in Kota Bahru and then a 90 minute taxi drops you at the jetty. 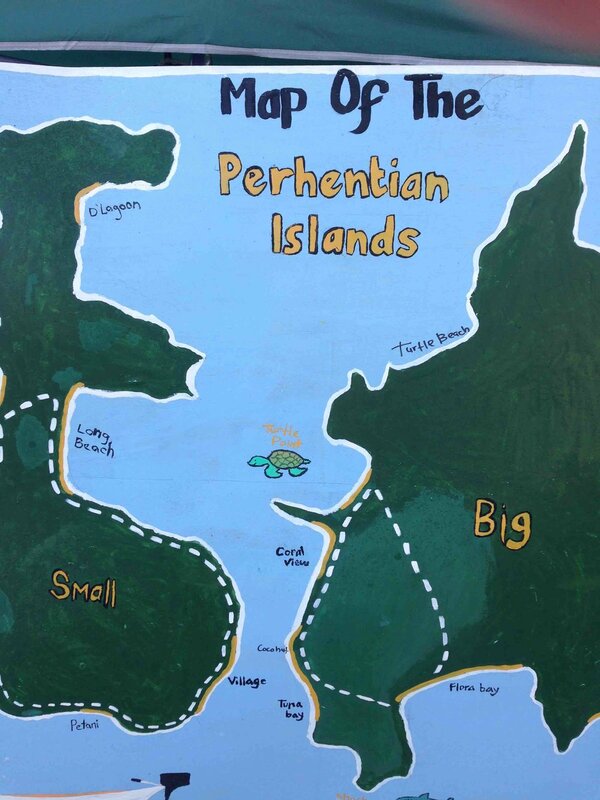 From there, a 40 minute boat ride takes you to the two principle islands of the Perhentians. While they do have Malay names it is much easier to identify them as the locals do: ‘ Big’ and ‘Small’. There are no 5 star resorts here. The closest they come to that is The 'Tuna Bay Resort' and that is 3 star. We, are staying down the beach at 'Coco Huts and Cozy Chalet'. It’s a little, two story motel like place with no more than 12 rooms. It is rudimentary but all rooms have balconies, television (of sorts) and AC. Pretty much the first thing we do is walk out the door, through the sand and into the water. It is clean and clear, just as advertised. A dip is followed by cocktail hour in one of our ‘suites’ and a walk on the beach to Turtle Bay for dinner. Instead of trolling through the menu I go up to the grill where fresh, local Tiger Prawns are being grilled over coconut husks. This is where real Tiger Prawns come from and grilled with a squeeze of fresh lemon is seafood perfection. The next morning, bright and clear, Carol has booked us an all day snorkelling trip. We begin at the rather ominously named ‘Shark Point’ and sure enough within a few minutes there are half a dozen Black Tipped Reef Sharks circling 20 feet below us. Not threatening at all and all about 5 feet in length they don’t come up and we don’t go down. Then, in a flash they are gone. Quick little buggers. Our next stop is called Coral Garden and it is just that. Having been to the Great Barrier Reef I can attest this is every bit as impressive with huge brain coral the size of a VW Beetle and fan coral waving in the currents, all in multiple colours of yellow, bright red and even blue. All around us are hundreds, thousands of tropical fish in every other colour in the rainbow. A magical place. After a quick beach lunch we off to Turtle Bay, a very different place. No coral at all, just white sand below you but if you dive down there are big loggerhead turtles that erupt from the sand and scoot away into the blue. The boat guy drops us on the beach and it is our Robinson Crusoe moment. Perfect white beach with a wall of green jungle behind us. Crystal clear blue water shallow enough to just lie down and drift away. Perfect. Our three day weekend accommodations, our airfare and taxi costs, our snorkelling trip, copious amounts of tiger prawns and beer cost us…… $450 USD, all in, for two. When one night in The Four Seasons Langkawi is $1,000 bucks before you eat or drink a thing, this is the bargain of all bargains.